My garage is a mess. And I feel the need to apologize for it, even though you will likely never see it. I only have a one-car garage at the moment. Actually, it’s a “no car” garage because there isn’t room for one! When we moved to Louisville from Indiana, we rented out our home (complete with a 2+ car garage) and lived in an apartment for a while. That meant, no garage at all. Maybe that isn’t a big deal to you, but it is hard for a motorcycle guy to go without a garage. Aside from bikes, I’ve got all sorts of gear, and all sorts of parts and accessories that have to go somewhere. Heck, I have jackets and pants that haven’t fit me in years, I just don’t know what to do with them. After a year in an apartment and my poor Street Triple doing time in a local storage unit, we moved to a condo. We are still renting so we weren’t too particular about the fact that this unit only had a one car garage. After all, it was better than none. There was really no question as to what was going in the garage: my bike vs my wife’s new car? Do you have to ask? Her car, which costs at least 3-4 times what my Triumph did, sits outside. At first I thought maybe I could get the small garage organized enough to fit both my bike and her car, but I have since given up on that idea, as the coffee business has taken over the rest of the space. I had the door up one day this week and was loading up a 110 pound bag of green coffee into the back of my SUV. My neighbor came outside and we began to chat. He told me that he could smell the aroma when I was roasting coffee. I apologized for that and told him that I did sample roasts in the garage some times. He thought I ran the whole business out of my garage, and I guess from looking at it, I can understand why. It sort of looks like a postal truck had an accident with Juan Valdez’s mule…and it all landed in my garage. Right now, aside from my motorcycle and a couple bicycles, I have 550 lbs of green coffee in burlap bags, all sorts of food grade containers, boxes of packaging and labeling supplies, a banner, pop up canopy, a Bunn Airpot Brewer and multiple airpots, a commercial grinder, etc, etc, etc. What a mess! I envy the guys who have perfect garages. I’m a little afraid of their mental state, but I envy them nonetheless. I mean, what kind of person has a garage that looks like this? 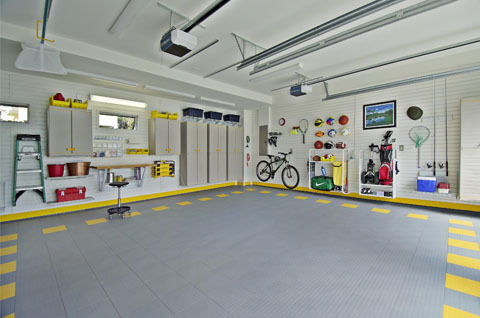 Can you imagine the pressure you would be living under to keep that garage looking this neat all the time? I would have a nervous breakdown! I could play Springsteen and Stones concerts on the TV all day and no one would complain. I could hang out at my own bar and sip a little Country Boy Cougar Bait with my buddies while we planned our next ride or debated our next bike purchase. 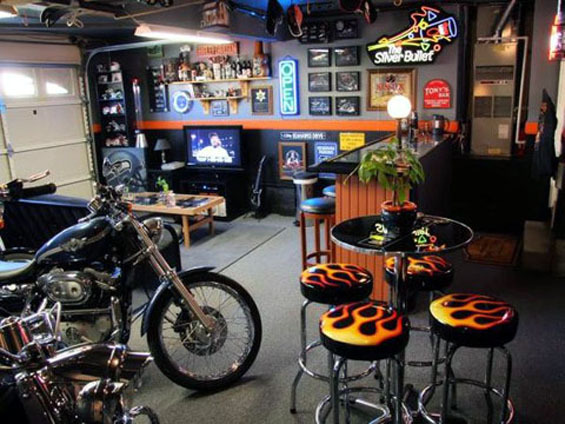 If I had a garage like that, I would probably never get any work done because I would never want to leave it. Guess I’m better off with a mess…it motivates me to get out! Oh, and for the record, Motorhead Coffee is produced in a board of health approved facility!